I was on the PPS blog the other day talking about the very basics of stamping, the kind of supplies available and how to make your pick. 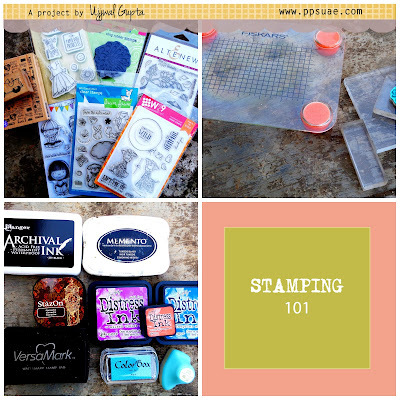 I am sure if you just starting out your stamping journey, you will find this useful. Look how the paper pleats make for the cutest candles. Doesn't that stitched sentiment look pretty too? Here is another variations I came up with. Just wanted to stop by and share this lovely scrapbook I made for a little girl. The size is huge 12"X12" and the papers are mostly from Simple Stories Collection! I hope you like it! If you do, don't forget to leave a comment :) Have a lovely weekend! 10 things I love about you..
...thats what I told my DH yesterday as it was our engagement anniversary. One year back on 16th of May, we got engaged and I wanted to gift him something special and different and that is when I stumbled upon Monicka Wright's blog and decided to case her wonderful note card. I took the colors from Smidapaper May Color Challenge, polka dot theme from Lawnscaping Challenge. And I am also playing along Wee Memories Scrappy Saturday Challenge#56 - Get Sticky. Heartfelt Creations January Alumni Blog Hop! Reverse Canvas Wall Art + VIdeo Tutorial!